Students who enjoy and are interested in music, will find abundant opportunities and activities at MacKillop College to pursue their interests and realise their potential. The comprehensive instrumental music program offers tuition on most instruments and singing. Students are encouraged to undertake music exams through the Australian Music Examination Board. Instruments are available for hire from the College at a minimal cost. 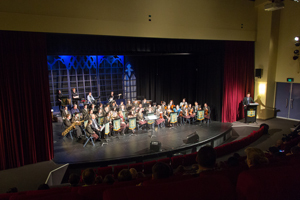 The Musical and annual music nights are two major events in which students an display their talents in playing an instrument, singing, dancing and acting. There are various musical ensembles available to all students, including the senior and junior concert bands, the string, ensembles and vocal groups. The College encourages and supports students to form their own rock groups and popular ensembles by allowing them to use school equipment and rehearsal rooms.